How to be a snacktivist! There was a time when the phrase, “I want a snack” sent a shiver of fear right through me. Even with a fully stocked kitchen I have still found myself struggling to find a suitable snack that I want to feed my kids and that they also want to eat. But now we have a list and a strategy and life is substantially simpler… as much less stressful for us as parents, which is the main thing! The list. This is my list of ‘go to’ snacks. This is not a fixed list, stuff gets added to it whenever we think of something new and there are guest appearances, often from home baked goods. We try to limit the amount of “unhealthy snacks” (you know the ones!) as we have found that if the kids know that there is a large about of junk in the cupboard then they will pester us for that and decline other options. Keeping our homes a safe spaces in terms of food makes a huge difference to the nutrition of the whole family. Try new things. 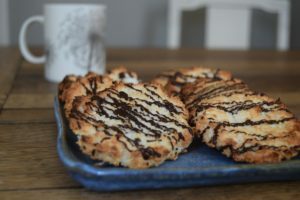 We tried home-made macaroons. They looked great, they even had chocolate on them but they were dry and tasted like dust…. even the kids wouldn’t eat them! Life in the kitchen, especially when considering healthy eating for kids, is about trial and error! Having a list is one thing, getting kids to eat stuff off that list is another ball game. This is where we need a strategy and a set of rules. Even better, it involves another list! This second list needs to be remade every week. I know that sounds like a pain but once it has been made you are in for a week that is free from the phrase “I want a different snack!”, worth the effort I think! The second list should be one of around 6-8 snacks that you have available for that week. 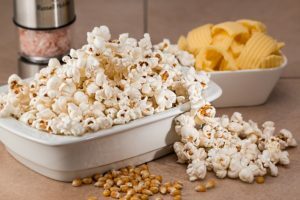 It can be a combination of sweet, savory, home-made, processed, etc… The rule is that at snack time (twice a day as stepping stones between meals and not within an hour of a meal), kids get to choose anything off the list as long as they have not eaten it the previous day, i.e. 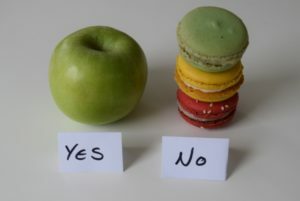 if you had an apple as a snack yesterday, pick something different for today’s snack. If you are going out, try to agree on snacks with your kids before you go. Don’t beat yourself up if you forget; that is all part of being a parent, sometimes pork scratchings and Scampi Fries will have to do! Another tip is how to handle the begging for a snack whilst you are making dinner? Sorry, the snack list is closed for the day, but you can have anything you like from the chopping board for dinner, preferably the veg… not the raw chicken. So that’s the theory. 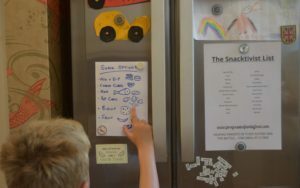 A snack list that changes regularly, gives kids the power of control over what they eat (which they love!) and also gives us an opportunity to introduce new foods away from the pressure of the dinner table and it’s another opportunity to get nutrients into them! What’s not to love!? But this is just Snacktivism at home. 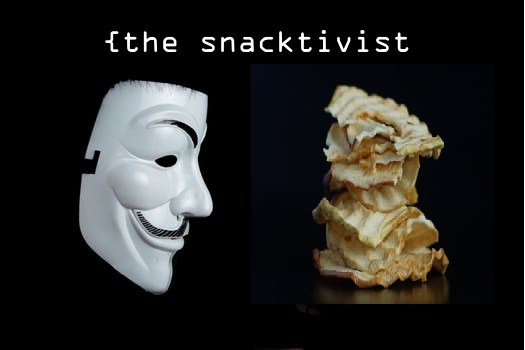 The true meaning of Snacktivism is attributed to Registered Dietitican, Sally Kuzemchak, author of The Snacktivist Handbook. Sally created Snacktivism as a grassroots effort to stop this unhealthy eating pattern–for the sake of our kids’ health. It is about finding a better way. It’s about thinking twice before serving snacks, about considering whether kids actually need a snack. And if they do, it’s about finding a better choice. It’s about offering whole foods and about making fruits and vegetables the default. It is NOT about giving up cookies and cupcakes. Instead, it’s about putting them back in their place as special occasion foods, not every day choices. Don’t forget to share if you think your friends would like to become a snackivist too! How much protein should I eat to lose weight, have more energy and feel fitter?